Why not only Brno, but the whole metropolitan area? 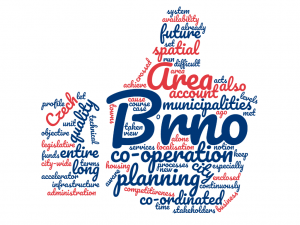 From a realistic point of view, the city of Brno already exceeded its administrative boundaries a long time ago. This makes things difficult at different levels of planning, management and administration. These processes in fact are not yet coordinated, let alone backed by legislative acts, as in the case of Western European countries. The city of Brno is aware of this and does not profile itself as a spatial unit, functionally enclosed within its administrative boundaries, but as a part of a broader territory of the Brno Metropolitan Area. Together, in cooperation with other towns and municipalities, we started writing a new chapter in terms of understanding the notion of strategic planning in the Czech Republic. The ITI Territorial Tool became the right impetus for setting up long-term cooperation between Brno and its neighbouring municipalities, which will be beneficial to all the stakeholders involved. The metropolitan level is also strongly reflected in the city-wide Brno2050 Strategy, which is currently in course of preparation, and will also be taken into account in the forthcoming Strategy of Regional Development of the Czech Republic 2021+, that is currently being prepared. What are we trying to achieve in the long run by doing this?